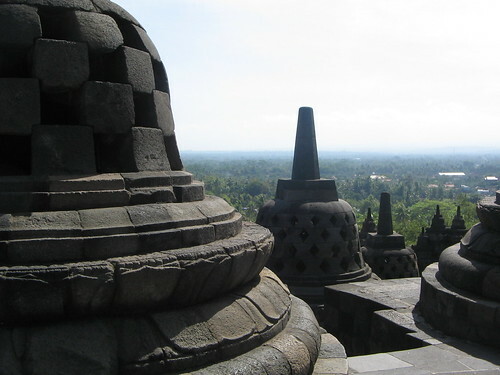 Candi Borobudor, originally uploaded by tgtwb. I have just returned from a work trip to Bangkok, Thailand - which was easily my most stressful trip ever! But my most recent trip was a major headache and i didn't like it one bit. I was so determined to get myself a new set of nature DVDs to add to my collection. And i knew DVDs are cheap in Bangkok (even the originals!) and so i set on a quest, looking for Planet Earth and i got it at a shameless steal of course! And so i was watching the first episode of my newly acquired DVD with wide-eyed enthusiasm this morning, right after morning prayers. My idol, Sir David Attenborough, was the given narrator for this series, which i found out was recorded fully on High-Definition. No idea what that is anyway, but i heard from a human friend, that you will basically get super intense pictures and with awesome sound (and the fact that it was done expensively) - which was exactly it. I am totally blown away at how sharp the images are and sound so clear, i could almost hear the narrator breathing in between pauses! Way cool! The first episode featured some of the most unbelievable footage you will ever see on screen. 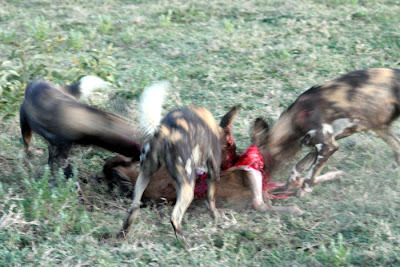 It was all good... then i got to the part where they featured the nimble African Wild Dogs posse hunting for its prey, shot in Botswana, Africa. 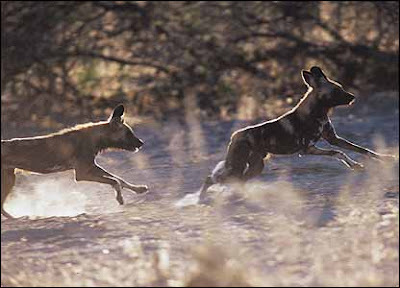 Teamwork and tactics make African Wild Dogs efficient predators. "Their secret is teamwork..." was what the narrator said - which was exactly what fascinated me most! Just think about it - they work in groups. They split up when work beckons, but their aim is all the same - to find that one meal for all. And i'm thinking, well... this is much like in an organisation where we each hold a different duty within the company but our ultimate aim stays the same course - for the benefit of the organisation. And really, that is the beauty in the spirit of teamwork, without which, it will be almost impossible to accomplish a task! What a revelation! Absolute Awesomeness! Anyways, this will be the first of the many post to come on Siem Reap...! Fact: Tuk-Tuk Uncle No. 3745 was the cheapest, friendliest, most pleasant looking Tuk-Tuk Uncle in the whole of Siem Reap (Oh yes! We went Tuk-Tuk shopping!!!) He wasn't pushy (like those other buggers), always smiling and very very patient. Ok, so his Tuk-Tuk wasn't equipped with the largest seats for our bearish buttocks and it was a little squeezy and squeaky but he was our best choice. 3745 is also, only 42 years old (despite his looks) and resembles my late grandfather from the state of Perak, Malaysia. WARNING! Our depiction of Siem Reap is biased! And only centered within the compounds of the Holy Temples of Angkor Wat... Those who have seen more of SR should look away now! This is an aerial overview of the majestic temple of Angkor Wat, from atop Bakheng Hill. The temple in which you will have to climb hand and foot on is called the Phnom Bakheng - which is easily the most scenic, solitary refuge you probably can find in all of Angkor. BEAR NOTES: Arrive at the summit of the temple just before sunset and if you're lucky, you might just be able to spot the Angkor Wat down below (you normally would anyway!). According to some guidebooks, you would also be able to see the Phnom Krom to the Southwest near the Tonle Sap, Phnom Bok (pronouced penumbok for those in the know...) in the Northeast, Phnom Kulen in the East and the West Baray. And oh no no... It wasn't an easy climb either. What with our fat little paws and Cubbies with her little booties on her hands and feet. Wasn't easy at all! Bah! There were people who reported to have used the "elephant trail" up the temple which is apparently longer but less step. Well, from what we saw, no trails of the elephants here... so we used the shorter and oh-so-steep way up. Right hand... Left foot... Left Hand... Right Foot... Left Foot... Right Hand... Left.. no.. Right.. Arh.. Left... Duh!!! All those who survived the climb were disappointed that God wasn't there after all (what a bummer...) and most paced around the top snapping pictures after pictures of the areas surrounding the temple, while waiting patiently for the Sun to set. And the moment we've all been waiting for... An overview of the sunset in Siem Reap from atop Bakheng Hill (temple, one of the hundreds found in Cambodia alone!). It wasn't much of a sunset that evening because the evening was cloudy; but it was serene and breathtaking nonetheless! After the sunset and on our way down from the long climb uphill, we were greteed by a string ensemble consisting of musicians (with physical disabilities) who were victims of the vicious land mines, laid down by the Khmer Rouge, the Heng Samrin and Hun Sen regimes, the Vietnamese, the KPLNF and the Sihanoukists. Apparently (though not surprising), Cambodia has one of the largest rates of physical disability in any country in the world due to land mine accidents! And even till today, no one know exactly how many landmines were planted in Cambodia and how many still remains.